The 24 air-conditioned rooms and suites at Antica Torre di via Tornabuoni 1 are sophisticated and elegant, with traditional and contemporary elements working really well together to create a classic timeless style. All rooms are en-suite and feature LCD TV, pay per view channels, telephone, complimentary WiFi, mini-bar, tea and coffee facilities and a safe. Decorated in Florentine style, the Classic rooms offer enchanting views of the city rooftops, via de Tornabuoni or internal façades. 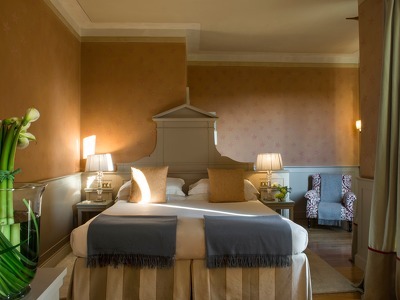 All rooms are enriched by unique pieces of furniture: antique wardrobes and reading tables; hand-painted headboards, carved out of original 18th-century wooden doors and floors. All rooms are available either with queen-size bed or two twin beds and they all feature a marble bathroom with either bathtub or shower. 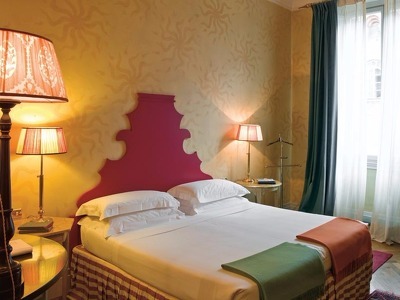 The Deluxe Rooms are located in the Medieval tower with views of the Duomo and the surrounding countryside and are ideal rooms for friends as the queen size bed can be converted into twins. The en-suite marble bathroom has a bath or shower. The exclusive jasmine-perfumed private terraces and sweeping views of Monte Morello and the Apennines characterize these splendid rooms in the Medieval Tower. These extremely bright and quiet rooms are available either with queen-size bed or twin beds and have marble bathrooms with bath. One of our favourite rooms is the Library Room which is filled with a collection of rare antique books including volumes about Florence. 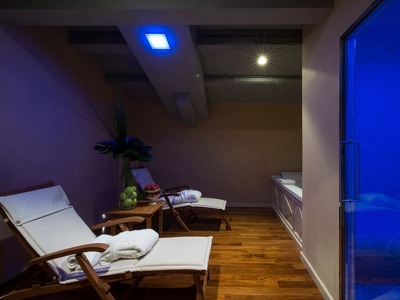 The high-ceilinged room has a wonderful large marble bathroom with bath and rain shower. The windows offer views of Piazza Santa Trinita and Palazzo Feroni Spini or the Arno. 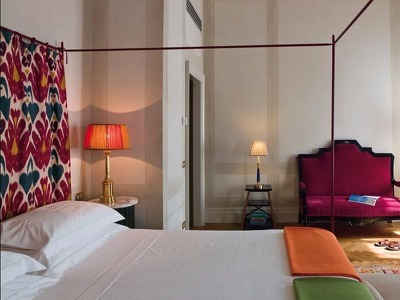 The views of Via de 'Tornabuoni and the inner courtyard enrich the Suite with charm. The suite features fine parquet floors and the bedroom is available with double bed or two single beds. The en-suite bathroom is decked out in full marble Red Verona with bath. In the living room, there's a sofa bed to sleep 3 people in total comfort, and there's a library that includes contemporary books and classics. The captivating private terrace overlooking the Arno and the view of the Ponte Vecchio make this Suite completely unique. 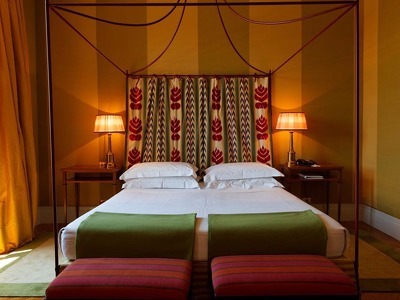 The room is finely furnished with a canopy bed and the walls are decorated with elegant, hand-dyed fabrics. There's a single alcove bed separate from the bedroom in an elegant alcove, and the en-suite bathroom in Calacatta Oro marble features hand-painted walls with floral motifs, separate toilet and large bath with balcony overlooking the internal courtyard. 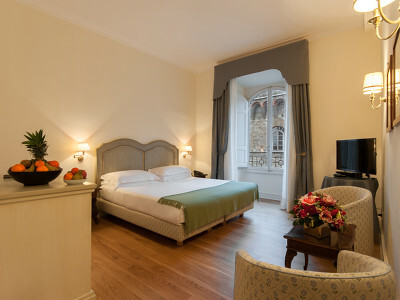 The Romantic Junior Suite is, as the name suggests, perfect for guests looking for a romantic few days in Florence. The sunset fills the room which is decorated with frescoes and the 3 large windows look onto the river Arno, the Ponte Vecchio and Santa Trinita. A candlelit bath in the en-suite Jacuzzi will revive you after an intense day of sightseeing. The beige and azure-striped walls decorated with damask motifs make this room truly unique. The sunset emphasizes the vivid colours of this magnificent room, elegantly frescoed, with three picture windows offering views of the Arno and Palazzo Feroni Spini. The view of the principal bridges of Florence, Ponte Vecchio and Ponte Santa Trinita, creates a truly unique vista. A candlelit bath in the en-suite Jacuzzi will revive you after an intense day of sightseeing. The room is furnished with wooden floors, canopy bed, circular marble table with comfortable armchairs, spacious sofa, and a marble bathroom with separate toilet, "panoramic Jacuzzi" and shower. The sloping heritage roof that completes the original exposed white beam ceiling, in perfect keeping with the authentic Florentine tradition, complements the room’s distinctive vistas. 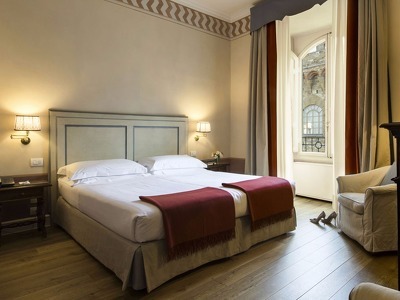 The windows offer breathtaking views of the Arno river, the Oltrarno, and Ponte Vecchio, whereas the frescoes and the bedstand, inspired by the Basilica of Santo Spirito, reflect the panorama and create an ambience suffused with charm. The room boasts an en-suite marble bathroom with a large shower as well as a separate wellness area which includes a double Jacuzzi, steam bath for two and relaxation area. 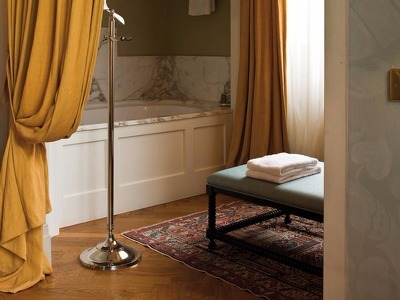 Situated on one of the best shopping streets in Florence, Antica Torre di Via Tornabuoni 1 is a 13th-century luxury boutique hotel which lies at the very heart of this beautiful city. Just a few moments from the Arno and walking distance from some of the best bars and restaurants in Florence, this Chic Retreat is one of the best places to stay in Tuscany's capital. Guests staying in one of the 22 rooms and suites feel looked after and cared for right from the word go and many end up staying longer than anticipated. 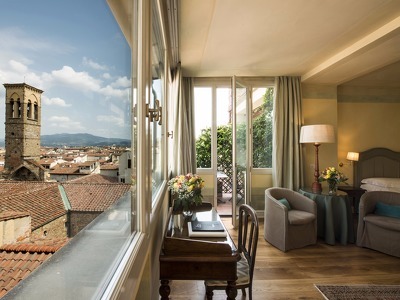 Antica Torre di via Tornabuoni 1 boasts 2 magnificent terraces with breathtaking panoramic views across the whole of Florence. Anything and everything can be arranged from private trips to tasting sessions. Florence is the perfect city to explore on foot with plenty to see and savour, from the Uffizzi Gallery to the Duomo. Wander the nearby shopping outlets or enjoy a wine tour through the city- the choice is yours. Breakfast at Antica Torre di Via Tornabuoni 1 is a traditional Italian buffet served from 8-10 am. During the summer months, and sometimes even during the cooler ones, it is served on the terrace. Being so centrally positioned, the hotel has many dining options right on the doorstep. Guests can find delicious pizzas, pastries and wines within minutes of their room. Exit the A1 highway at Firenze Impruneta(Certosa) and continue in the direction of the city centre "Centro" on Via Senese. Turn right onto Via Gelsomino then turn left onto Viale del Poggio Imperiale to a round square with a big statue. Access the city centre through the old city gate "Porta Romana" and continue on Via Romana. Bear left into Via Maggio. At Santa Trinita bridge turn left onto Lungarno Guicciardini. Turn right at Ponte alla Carraia (traffic light), cross bridge, enter Piazza Goldoni and turn right into Via Del Parione. At the end of Via Del Parione, turn right onto Via Tornabuoni where the hotel is located (opposite Ferragamo). Stop to unload luggage in front of the Antica Torre and have Reception call for the valet parking. Florence Airport, 30 minutes by car or 30 minutes by bus. You will need to take the LAM PO-FI, and then the 22. If a cancellation is made within 3 days of the arrival date, 100% of the total price will be charged. Pets are welcome upon request in rooms with balconies. The 24 air-conditioned rooms and suites at Antica Torre di via Tornabuoni 1 are sophisticated and elegant, with traditional and contemporary elements working really well together to create a classic timeless style. All rooms are en-suite and feature LCD TV, pay per view channels, telephone, complimentary WiFi, mini-bar, tea and coffee facilities and a safe. My wife and I stayed here for our first wedding anniversary. The hotel is beautiful and the staff is incredibly friendly. Also, it's a great location in Florence. Easy to get out and enjoy the sights. Very nice place to stay, easy walk to everywhere in town and great roof top bar and restaurant. Very cool hotel. Would recommend.